Lamb is tasting great right now and even better when cooked using this recipe (if I do say so myself!!). This easy carve lamb leg gives you the best of both worlds with a quicker cooking time and the added flavour coming from the bone. Oh, and did I mention it’s easy to carve too..
With Christmas just around the corner I decided to do up a good lamb recipe. Well, I really did the recipe because we love eating lamb here in AnotherFoodBloggers house but also because as an alternative to Turkey some people like to eat lamb on Christmas day – my wife being one of them! Her family would always have a roast lamb on the table. None of them were super keen on Turkey so here is my version of the lamb we will be eating over the holiday period. In case you all hadn’t realised from previous posts we are living abroad in Australia and our families are back in Ireland. So the holidays can get a little lonely. Luckily though my wife has a little time off work and our daughter is old enough to understand Christmas now. Coupled with the fact I like to cook our plan is to sit around in the INSANE Brisbane heat – which is weird AF for Christmas, drink a “responsible” amount of great Tassie sparkling, eat some delish food and get a Christmas swim in too. 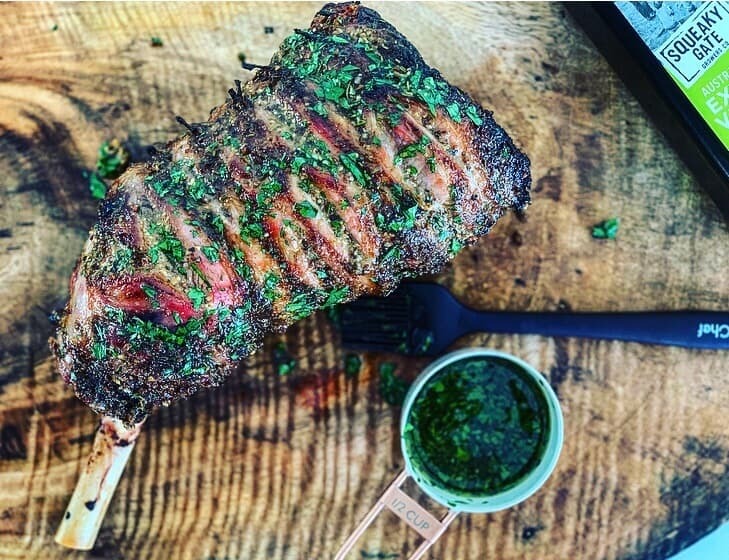 Our Weber will be on and some tasty easy carve lamb leg will be bbqing away. Hoping it will be ready just in time for when the 3rd glass of bubbly hits the belly and we are wanting food. Having a well stocked pantry and spice drawer comes in real handy with this one. Everything used to make the lamb, except the lamb itself was already present in our house. 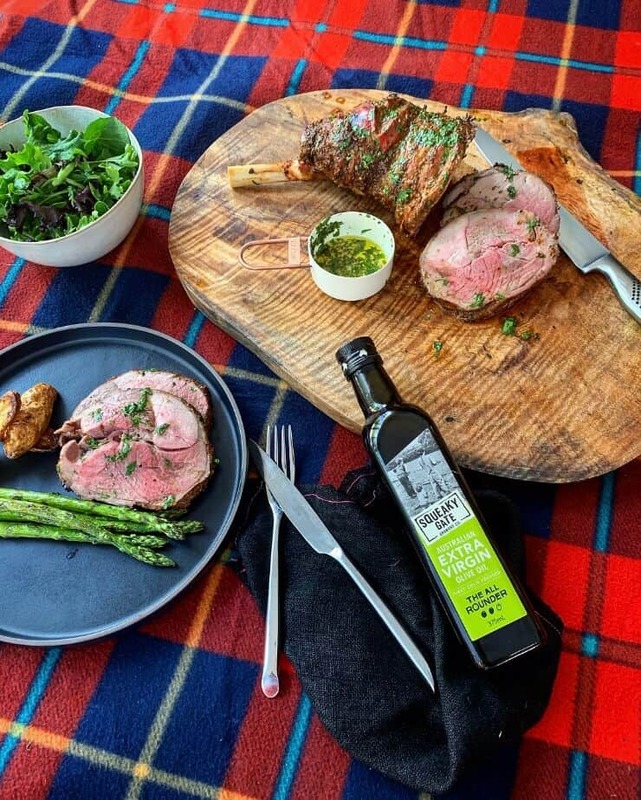 First it started with some top quality oil and here I looked no further than delish Squeaky Gate – a great Australian olive oil that’s both affordable for every household AND packed with enough flavour for even the most discerning palate to enjoy too. So I grabbed as many spices as I could carry, some fresh herbs and whipped up a cracking paste to marinade the lamb overnight. The next day I fired up my Weber (can be done in the oven if you aren’t lucky enough to own a Weber) and cooked this baby in just a little over 1hr. Hoping you all have a great Christmas and if Turkey ain’t your thing then give this easy carve lamb recipe a go. It will easily serve a family of 4 with the usual too many sides on the Christmas table. Assuming, that is you are like my folks! Using a sharp knife score the lamb in multiple places. Mix all the rub ingredients together and rub into the lamb. Leave lamb covered in the fridge for minimum of 1 hour but overnight if possible. Heat BBQ or oven to 180c and cook lamb covered gently in foil for 30 mins on indirect heat if using BBQ. After 30 mins uncover the lamb and cook for a further 30 mins basting twice during this time. 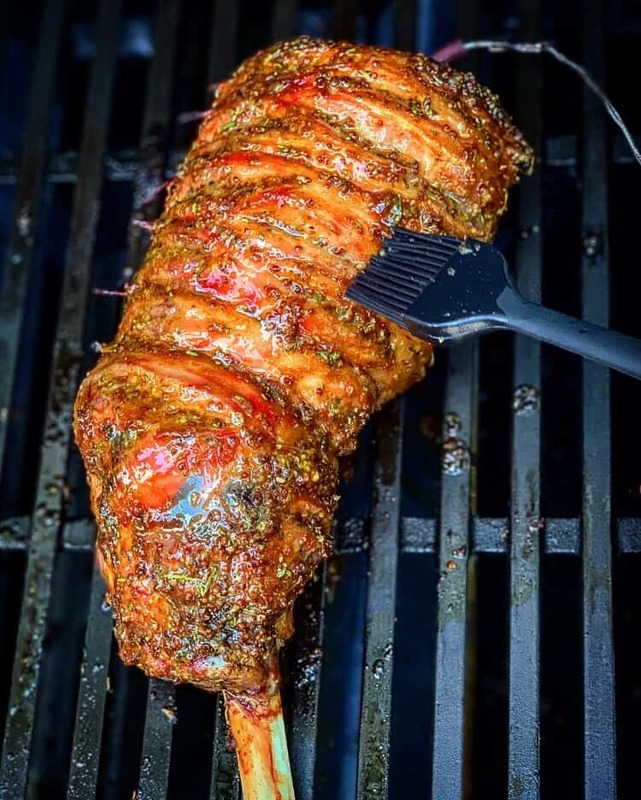 Once lamb is cooked to an internal temperature of 54c (for medium rare) remove from the BBQ and recover gently with foil and allow to rest for 10 mins. Once rested, baste it with the dressing and serve. I would serve this with a nice green salad and maybe some grilled asparagus. Such a perfect Australian Barbie Recipe 😉 Love all the spices and herbs you used, it sounds delicious! Ok now I am drooling and hungry! I never fully valued a good BBQ meal until I moved to Texas and wow the idea of BBQ lamb sounds delicious!!! Even though you are far from family it sounds like many memories will be made! Well I am a vegetarian except eggs. But I am pretty sure, I am going to share this with my friends as there are few who loves lamb no matter what. Spices and Herbs with Lamb , this is something, they never had. Pretty sure, they would love it. As a self-proclaimed meathead, there is so much ‘YES’ from we with this recipe! Have pinned to try later!! I have never had lamb meat before. This looks delicious. I am very curious to try this. But don’t know where I get lambs near me. This looks incredible! I don’t think I’ve ever made lamb before. I really should. I’m sure everyone would enjoy it. You have never cooked lamb!? Well now is defo the time to start!! Wow I never have seen lamb looks so well prepared before. I bet my lamb won’t look nearly as good if I attempted to try this recipe. But I still will go ahead and do it anyway. I don’t eat meat anymore, but even when I did, I never ate lamb. I’m not sure why, I just never tried it. My Nana loved it though! Wow this looks amazing! I definately need to tru this recipe. Thanks for sharing! I love this recipe. I’ve tried it before and it was really good. Thanks for sharing this wonderful piece of information online. I’m actually thinking about changing my Christmas menu to lamb for something a bit different this year. The potato and asparagus look lovely. As a vegetarian, I cannot say anything about the meat. This looks so good!! I’ve never had lamb, maybe I should try it. Thanks for sharing!! This looks good. I may consider making it for Christmas. I have never had lamb, but now I really want to try it. It looks so tasty. This recipe looks amazing! I am cooking lamb tomorrow and I can’t wait to try it out! Thank you so much for sharing! This looks so delicious! I love lamb but hardly ever cook it! I really need to get onto this recipe. Thanks for sharing! Who wouldn’t want to get a recipe like this? I agree, Christmas in Australia is different especially the weather. This is definitely part of my bucket list. I don’t have lamb often and never have prepared it. But, when I do, I will be sure to try this lamb. So yummy! Your recipe and the pictures are mouth watering! looking so delicious , If I have time qill try it this weekend! I have never eaten lamb before, but I’m so tempted to try it! I’m trying now to eat meat so much anymore, but I’m curious!